American luxury manufacturers like Lincoln and Cadillac have always catered to a different kind of clientele than their German counterparts. On this side of the pond, luxury means large, soft-driving cars that are as apt to induce a driving coma as they to get you to the country club. In the land of Lederhosen and Bratwurst, luxury means an unparalleled balance of brute power and luxe refinement. General Motors has started to realize that as the market ages, younger buyers that have grown up on German and Japanese performance sedans don’t take too well to buying land yachts that cruise around on cloud-like suspensions. There are people out there who want Corvette performance without owning a two-seater. They want heated leather seats, power everything, a high-tech nav system and the ability to carry the whole family – or just their bros – with them. They want what their cousins in Europe get – powerful sedans that are just as comfortable devouring apexes as they are rolling down the interstate. To that end, Cadillac created the CTS-V. In this case, V stands for very, very fast. From its heinously powerful all-aluminum V-8 to its sinister exterior, the V oozes power – and does so while serving up all of the creature comforts that make the Cadillac brand top of the line. Think of it as a lethal new breed of American luxury. This is the fastest, most powerful Cadillac produced by General Motors – ever (!) – which is a fact that the car is happy to remind you of. The supercharged 6.2-liter V-8 has a healthy rumble that brings a smile to our faces, and the Tremec six-speed manual transmission is a glorious thing to throw while hitting an on-camber slice of road. Similarly, the six-speed automatic doesn’t hurt our feelings, thanks largely to the paddle shifters and smooth gear changes. In fact, the CTS-V in its automatic guise set the fastest time ever for a production sedan on Germany’s Nürburgring Nordschleife, with a blistering time of 7:59.32. Think of that when you are stuck in rush hour traffic. While we like the idea of a stealth bruiser, we would like a little bit more differentiation between the track-deadly CTS-V and the hordes of CTSs populating the local retirement center. To the uninitiated, it looks like just another Cadillac with some extra parts thrown on. We wouldn’t mind a little more flair – we said flair, not bling. We could do this all day long. Planting our right foot in the floorboard results in chirp of pain from the super-sticky Michelin Pilot Sport 2 tires out back before they bite hard, launching the CTS-V to 60 mph in just about 3.9 seconds. The sensation is unreal. The 551 lb-ft of torque generated is crushing, and we mean that in the very best way possible. The engine simply flings itself into the redline, with no perceptible diminish in power output as it nears the rev limiter. Things only get better. Put the V’s traction control into “competitionâ€ mode and tweak the suspension to ‘sport’ mode, hit a corner hot and the car rotates beautifully, spewing tire smoke in tail-happy glee. Both six-speed transmissions are well engineered, though under full-bore acceleration the auto has a slight tendency to delay upshifts via the paddles. Best to let the automatic manage itself – something it’s superb at. The CTS-V’s 15-inch Brembo brakes are simply phenomenal and on of the best systems in any sedan today; this is a daily driver with heart of a monster. You expect an American car to go fast – but fast around a corner too? This is the new way. 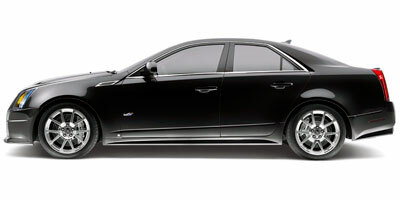 Cadillac’s new sports sedan is powered by a supercharged LS9 6.2-liter V-8 sourced from the Corvette ZR1. While the engine is a somewhat detuned version of the mill that powers GM’s $100,000 supercar, it still manages to put out 556 horsepower and 551 lb-ft of torque. The engine is coupled to either a six-speed manual or six-speed automatic transmission that puts power to the rear wheels. The CTS-V sports an innovative suspension feature called Magnetic Ride Control. The shock absorbers react faster than traditional models to offer the best combination of ride comfort and performance handling. When coupled with massive 19-inch wheels and Michelin Pilot Sport 2 tires – there’s an amazing amount of grip for a car this size – you’ve got the complete package. This Cadillac serves up all the technology of a true luxury cruiser. Serving both work and play functions, the car includes a 40 gig hard drive for storing music, satellite navigation via a pop-up touch screen and a Bluetooth capable Bose audio system. With a supercharged V-8 under the hood, this isn’t a lightweight at the pumps. GM has yet to release any official details on the sedan’s mileage characteristics, but we can guess it will be close to the ZR1’s 14 mpg city, 20 mpg highway. Given the CTS-V’s brute power, those numbers aren’t too bad. The CTS-V’s interior communicates the rest of the car’s demeanor. Hand-stitched leather and microfiber meet deep black obsidian accents, lining up the car’s comfortable lineage with its new muscle-bound physique. The sports seats up front provide a decent amount of support, but in a car this aggressive, the optional Recaro sport seats with the higher bolsters to keep you in place do the job best. As we’ve said, from a distance it’s hard to discern the CTS from its more diabolical brother, the CTS-V. Both cars are incredibly handsome, with the V offering a more angular front fascia, a mesh grille and bolder wheels. The look is one of subtle strength. The CTS-V is being sold at the base of $60,700, but the car is aiming for serious contenders like BMW’s M5 at $85,100 and the Mercedes-Benz E63 AMG at $86,875. That will also put it in the ring with Audi’s RS4 at $66,910. Coming in at a hair over $60,000, the CTS-V is undercutting the competition and offering some serious bang for the buck. The CTS-V is proof that America can do performance luxury and do it well. It’s American muscle, capable of boxing sports car ears on Friday night and playing 18 holes the next morning. The car marks a serious effort from GM to prove that it can hang with the Bavarian bruisers that have dominated the scene for years. The competition should be worried, because from the well-sorted interior to the surprising handling and V-8 grunt, there’s little to argue with here.